My choices for how to spend my unexpected Friday off were: (1) clean house, or (2) bike to Glencoe. Although the house badly needed to be cleaned, I reasoned that I could pass at least some of it on my two grown children, and the pull of the stroll through the prairie island at the Chicago Botanic Garden was strong. As a self-employed person, I almost always feel the need to do something productive, and I briefly considered bringing my laptop along. I've spent time catching up on some writing at the Lenhardt Library before, and it is indeed a very pleasant place to work. However, I decided to go minimal and really dedicate myself to enjoying time off, so I set off with only my bike lock, wallet, phone and a small notepad. I'm not the fastest of cyclists, but I have to fight the urge to catch up to other riders, especially ones who are traveling just slightly faster than I am. I had to focus on going at a brisk but comfortable pace in order to enjoy the ride and not make it a pursuit. I've mentioned elsewhere how much I like the North Branch Trail. The new extension of it connecting Mayfair to Edgebrook is very nice, and the portion of the trail that meanders through a mix of prairie, oaks and woodland just south of Dempster is really lovely. But I think my favorite section is north of Golf Road, where the stretches between surface street crossings get longer, and -- although there are places you can definitely hear the hum of traffic on I94 -- the dense woods along the river screen away the office buildings, the shopping malls and other evidence of suburban sprawl, and really make you feel like you've left the city behind. At the CBG, I locked the bike at one of the racks closer to the south gate at Dundee Rd (the CBG charges only for parking, so admittance is free if you arrive by bike), and sauntered to the main part of the garden through the Dixon Prairie, Evening Island and Water Gardens. The CBG now features a fabulous little summer innovation known as the Rose Terrace Beer Garden, and I have to confess, this was on my mind as I made my way slowly through the various horticultural attractions. As I sat enjoying a very pleasant lunch and a pint of delectable Hyssop's Fable ale (brewed by none other than our very local Lake Effect Brewing) it occurred to me that what I needed to turn this unexpected free day into an actual vacation would be a paddle on the water. With that in mind, I finished my meal, retrieved my bike, and headed a short distance to the kayak rental at Tower Road. By this point, it was getting a little late in the day, but kayaks are available for rent until one hour before sunset, and I could think of no more perfect way to spend the late afternoon hours than drifting along the quiet water under the canopy of overhanging trees. As the young guide pushed my boat off the shore, I literally felt myself melting into another world. When you paddle under the Tower Rd bridge, the Lagoons open up with many enticing channels to follow. You could easily lose yourself here for the whole day. Since I only had a couple of hours, I decided to follow the birds. At this hour of the afternoon, and with few other paddlers out on the water, the hunting birds were out in full force, though their presence was not always immediately apparent. The Great Blue Herons, of which I spotted at least a dozen, stand motionless like dead branches, and can be surprisingly hard to see. Startled, they take off with a loud, croaking squawk and startle me equally. Smaller blue herons are more skittish and even harder to spot. Stubby, chunky Black-Crowned Night Herons cling to improbably thin branches and teeter like sprawl-legged acrobats, their long head plumes wafting in the air as if for balance. Mother Mallards and Mergansers usher their numerous broods through the lush, algae-covered shallows, and the little ones eagerly scoop everything edible into their hungry beaks. 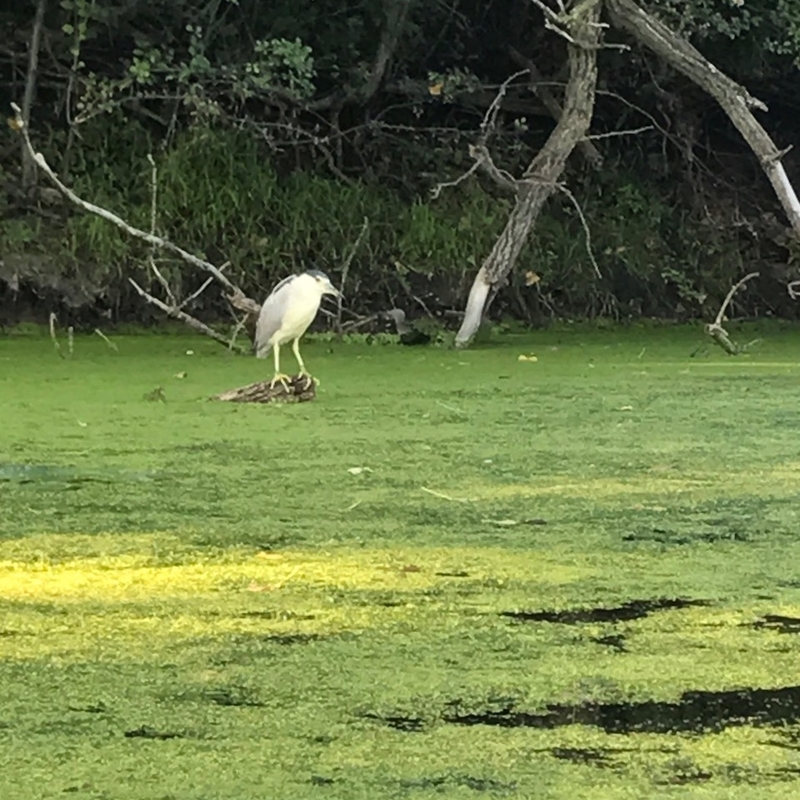 As I paddled gingerly and quietly along the shadowy banks, I was rewarded with sightings of two less commonly seen birds. I've heard the deep baritone "plunk" call of the American Bittern, but I've never seen the actual bird before. This one here nearly blended into the dun log he stood upon, except for the bright lime-green color of his legs. I sat quietly in my boat, and he let me get pretty close, and watch him for quite a while. But he didn't let me get as close as this Least Bittern (seriously, the smallest member of the heron family), which practically let me touch the branch he was on with the tip of my kayak as he perched virtually motionless, staring. Between these rare treats, the sighting of spotted fawns taking a sip from the river under their mother's watchful eye, the more common skittering muskrats and the Cormorants swimming with only their necks above the water, and groups of them drying their wings in trees under the setting sun, this was the richest selection of wildlife I've seen anywhere in the Chicago area. Although I would have happily paddled well into the evening hours, I was mindful of having to bike back before nightfall. I returned my boat and gladly paid the young man thirty bucks. I am here to tell you that the $15/hour rate is one of the best bargains around, and no spa, yoga or meditation will match the serenity of a late afternoon paddle on the water, or the relaxed feeling of peacefulness that will stay with you for many hours after. If you too need a one-day vacation, this is the one to take.